My wife found this self-published autobiography of Racine author Alice Hansche Mortenson for me, and I’ve read it several times. I’ve enjoyed it a lot, and I admire Alice for the work she put into this book. One thing I’ve learned over my years of reading history is that the simple act of writing down an event is immensely important. We don’t get to pass very much information down to succeeding generations, but we certainly won’t pass anything down if no one bothers to write. All throughout the book, Alice has included poems that she’s written to commemorate events in her life and to illustrate things that are important to her, such as her friends, her scrapbook, and religious feelings. 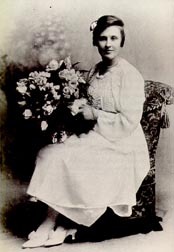 There are also many photographs, from her childhood, from her career as a nurse, through her first and second husbands, and to her retirement. 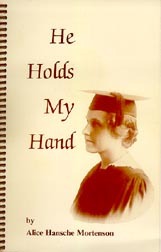 After graduation in 1919 we returned home to Racine, and the following April John and I were married by Rev. Morris Johnson, the same minister who had baptized John. I thought John should have been a preacher for he had done some preaching while at college — filling pulpits occasionally for absent pastors; he seemed successful in it, but he didn’t feel called and his heart was in farming. Not only is this a good book about times past in Racine, it’s a good book to read to see how someone handles the good times and the bad times in her life. Alice handles everything that comes to her with grace, and we are lucky to be able to read her thoughts from her long life of writing. If you would like a copy of this book, I recommend that you search Ebay from time to time. Copies seem to go on sale a few times a year. Dear Todd, Could “Sandy Beach” be found in the history of Racine? I really enjoyed reading about Alice Hansche Mortenson and her book. I will look for it on ebay. Do you recall that we would go out to Hansche’s farm for vegetables in the fall when you and Jason were children? I think that was the name of the one out near Parkside. I was just looking up info. on Alice Hansche Mortenson, when I saw your comments. Alice was my dad’s cousin. Her father, and my great grandfather were brothers. My dad turned 91 this April, and Alice would have been 117 this June. My dad was the youngest child of 10, so that’s why such an age difference. My grandfather and my father continued the farming business which lasted over 100 years, so that’s probably the vegetable farm you were referring to. The main farm was located on Hansche Road,(formerly called Hansche Loop because so many Hansches lived on it!) between Chickory and County Line Road, just off of Highway 32, not too far south of Lake Park. They had other land in the area as well, where they farmed. My dad eventually had a successful sod nursery, (and actually sodded Parkside when it was under construction). Alice published 7 books, mostly poetry, until her last book, He Holds My Hand. (My parents, Fritz and Gloria, are mentioned on page 148). She had 7 books published: Sunshine and Shadows, Poems from the Heart, Knee-Deep in Snow, I Needed the Quite, The Joy of the Lord, Just Around the Bend, and her autobiography, He Holds My Hand. We may have some duplicate books in storage, if you’re interested. Thanks for your memories….took me down memory lane as well. Thanks for the information! Those books sound very interesting. I have a copy of He Holds My Hand and I liked it a lot. I’ve even had people contacting me asking where they can get a copy! My grandmother and grandfather were good friends with Alice Hansche Mortenson. We have several hand inscribed books of hers. She mentions my grandfather in her book, I’m told. It’s being sent to me so I haven’t read it yet. She also encouraged my father to direct his first cantata in high school and set him on the path of being a choral director like his father. I’d love to hear more about this book once you get it. Thanks! I am very much interested in Alice’s books. Please let me know where I can find them. I just downloaded her poem I needed the Quiet and have sent it to several friends in Nursing Homes. Hello: I’ve been able to find Alice’s books on Ebay.